Well , sharing an AppDomain between web application is a gray-out area so i decided to create an article for this. This article does not cover SSL configurations. 1) Apps domains can be shared across web applications if the zone, application pool identity, and authentication schemes match. For example suppose that webappA is configured to use the Default zoneH and webappB is also configured to use the Default zone. In addition, both web applications use the same Application pool identity, and both web applications use NTLM. In this scenario, the web applications can share a single app domain. * As you can see , SharePoint only allows one global AppDomain by Set-SPAppDomain cmdlet . Lets have a look an example ; I assume that you have already created Forward DNS Lookup Zone and set CNAME for “ContosoApps.com” alias. http://apps-85f5fc12a6a559.contosoapps.com must able to land a IIS Site so “http::80:* ” binding handles this kind of request. And have to be same application pool identity (Contoso\spfarm). So far so good , as you notices we dont enabled “SupportMultipleAppDomains” feature which is added to SharePoint 2013 via March PU. Now it is time to test. I used the Yammer App from SharePoint App Store . Note: Do not use “System Account” when you are adding Apps ! 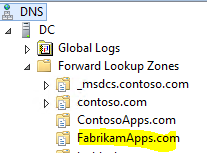 Each instance of an app for SharePoint that is installed has its own URL. Therefore, if you only have one app for SharePoint in your environment, but the app is installed on six different sites, then you will have six different app URLs. As you can see above pictures the AppID has changing. What about enabling Multiple AppDomains feature ? These cmdlets basically provide Isolation not for Sharing ! Adding another web application (4th one) to farm and this scenario we don’t want to use Shared AppDomain (ContosoApps.com) we want to assign a diffrent AppDomain (FabrikamApps.com) for this Web Application. And then we can assign this AppDomain to 4th web application. If we try to assing same AppDomain (FabrikamApps.com) for the 5th site , by design we face following error !. * Using Multiple AppDomains feature we can extend one of the web Application for a different zone(like Internet) for example “Jüpiter” -> (jupiter.fabrikam.com) and assign a different AppDomain but we could not use or share another AppDomain if assigned to another web Application or same web Application in different zone !